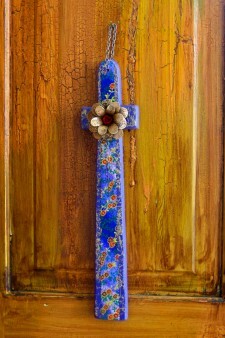 This large, decorative Southwest cross, painted blue to ward off “evil spirits”, captures the nuance of ethnic Northern New Mexico culture. 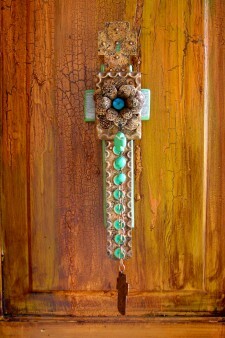 This cross is accented with a sunburst and a rosette. 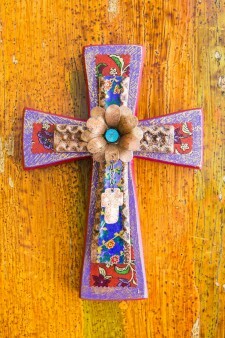 This cross is one of a limited edition. 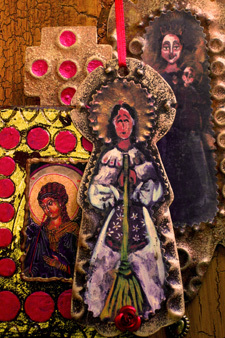 Because the papers used in its creation are unique and originate from paper collections found all over the world, only a limited number of this cross, pictured here, can be produced. When it is no longer available, we will replace it with a different version. 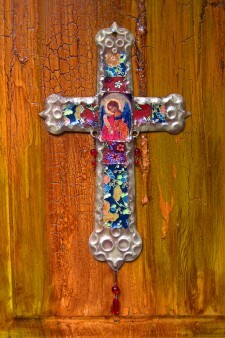 This cathedral shaped cross, featuring an image of Saint Michael, reminds us just a bit of the beauty of a stained glass window. Rich in pattern and pleasing in design it can be a significant addition to any cross collection or it can stand alone to enhance a space. 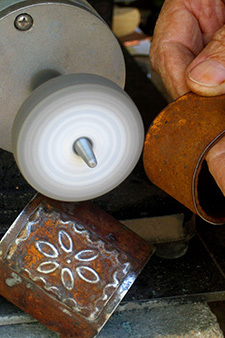 The brightly colored, richly patterned papers used on these products are unique and originate from paper collections found all over the world. 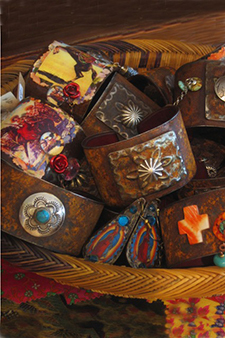 Like the products themselves, they are essentially one of a kind. 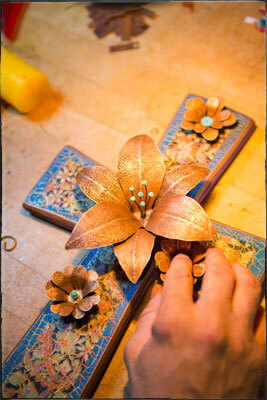 Whereas the design of each product is as you see pictured the colors and patterns that embellish them will differ. This means that any piece from our collection will be uniquely yours. 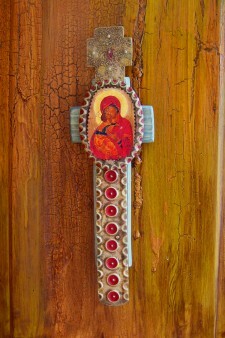 This handcrafted, ethnic saint cross featuring Madonna and Child is reminiscent of European Iconographic paintings that made their way to America with the first Southwest settlers. 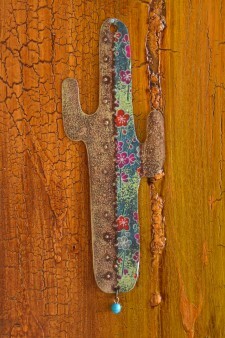 Teresa del Rito originally painted these images using the old techniques and traditional paints. 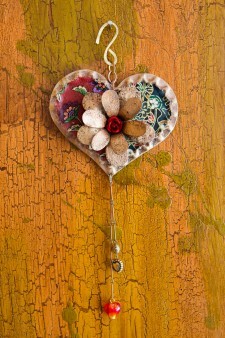 This exquisite jewel-like flowered heart has a Southwest ethnic beauty that is filled with love. 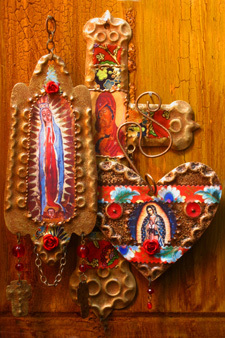 It serves well as a heart felt gift or an ornament for wall or tree. 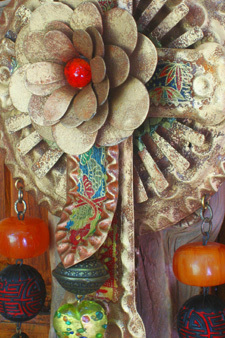 Hang this small tin ornament on a Christmas tree or use this special piece of art to decorate a wall. 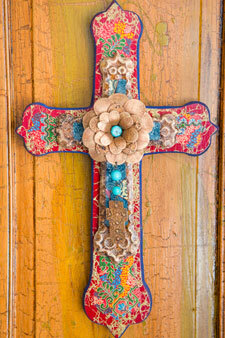 Put several of these lovely ethnic Southwest elongated crosses together and create a joyful, multi-colored presence for all enjoy. 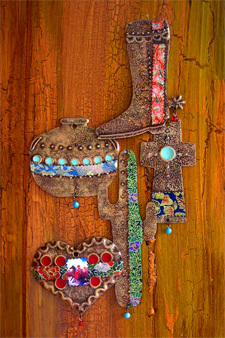 This Southwest cowboy cactus ornament brings a playful quality to any Christmas tree or can simply create a happy, bright spot wherever it is hung. 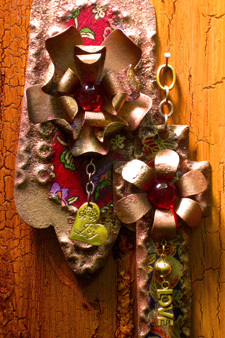 Hang this small tin ornament on a Christmas tree or use this special piece of art to decorate a wall. 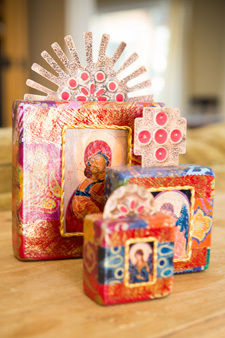 This delicately cut, colorfully papered and painted celtic shaped ethnic Southwest cross is embellished with coppery-textured tin, to create a unique version of a traditional design. This candle heart sconce is especially dear since the symbol of the burning candle at its center is a Southwest ethnic archetype we can all relate to. 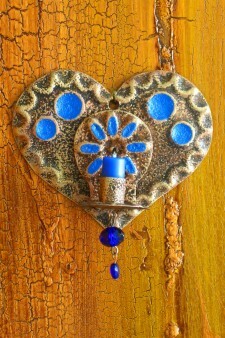 Hang this small tin ornament on a Christmas tree or use this special piece of art to decorate a wall. 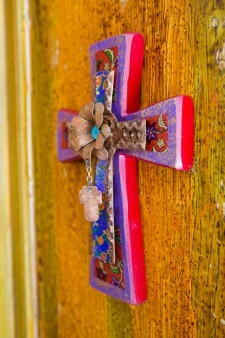 This brilliantly painted handcrafted ethnic cross, is inspired by the many festivals that can still be experienced each summer on plazas across the Southwest. It is a reminder of the festive ambiance and the wonderful singing and dancing that takes place there. 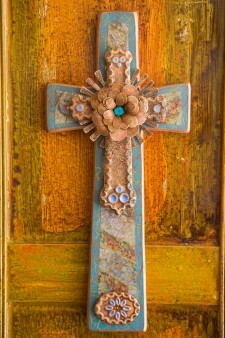 Just like its petite counterpart, this beautifully weathered handcrafted ethnic Southwest barn wood candle cross has everlasting appeal for anyone who finds the mix of earthiness and light intriguing.